Nestled along the Missouri River in Chamberlain and Oacoma, SD. 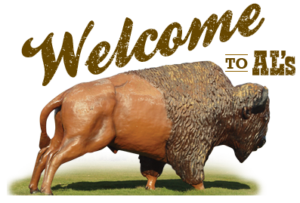 Al’s Oasis has historically been the premier resting stop for travelers along Interstate 90 (I-90). Here at Al’s Oasis we offer bus tour groups, vacationing families, tourists, and lone travelers more than just great food, lodging and shopping. We offer them an escape from their travels. We still have our delicious 5¢ coffee, which always comes with a free smile. Al’s Oasis prides itself on making a fun, convenient, and relaxing stop for you and your family. Tour Groups and Semis Welcome! Al’s provides easy access off Interstate 90 whether you are traveling East or West with ample parking for multiple buses and semis. Traveling with 45 or 50 of your closest friends? Al’s Oasis Restaurant caters to all tour groups and takes pride in being able to serve groups quickly and efficiently.